Immature B lymphocytes and certain B cell lymphomas undergo apoptotic cell death following activation of the B cell antigen receptor (BCR) signal transduction pathway. Several biochemical changes occur in response to BCR engagement, including activation of the Syk tyrosine kinase. Although Syk activation appears to be necessary for some downstream biochemical and cellular responses, the signaling events that precede Syk activation remain ill defined. In addition, the requirements for complete activation of the Syk-dependent signaling step remain to be elucidated. A mutant form of Syk carrying a combination of a K395A substitution in the kinase domain and substitutions of three phenylalanines (3F) for the three C-terminal tyrosines was expressed in a murine B cell lymphoma cell line, BCL1.3B3 to interfere with normal Syk regulation as a means to examine the Syk activation step in BCR signaling. Introduction of this kinase-inactive mutant led to the constitutive activation of the endogenous wildtype Syk enzyme in the absence of receptor engagement through a 'dominant-positive' effect. Under these conditions, Syk kinase activation occurred in the absence of phosphorylation on Syk tyrosine residues. Although Syk appears to be required for BCR-induced apoptosis in several systems, no increase in spontaneous cell death was observed in these cells. Surprisingly, although the endogenous Syk kinase was enzymatically active, no enhancement in the phosphorylation of cytoplasmic proteins, including phospholipase Cγ2 (PLCγ2), a direct Syk target, was observed. These data indicate that activation of Syk kinase enzymatic activity is insufficient for Syk-dependent signal transduction. This observation suggests that other events are required for efficient signaling. We speculate that localization of the active enzyme to a receptor complex specifically assembled for signal transduction may be the missing event. The B cell antigen receptor (BCR) is a multi-subunit complex that acts as a key sensor regulating the response of lymphocytes to their environment (reviewed in [1–7]). In mature B cells, activation through the BCR stimulates cellular proliferation and differentiation. In immature B cells, activation through the BCR induces either a state of unresponsiveness, termed anergy, or death by apoptosis, depending on the physical nature and concentration of the antigen [8–25]. In some B cell lymphomas, activation through the BCR can induce cell cycle arrest and apoptosis in vitro and tumor dormancy in vivo [19, 26–28]. The core of the multi-subunit BCR is membrane-bound immunoglobulin (mIg), which is non-covalently associated with two co-receptor molecules, CD79a (Igα) and CD79b (Igβ), products of the mb-1 and B29 genes [29, 30]. The biochemical changes induced by engagement of the BCR are extensive and include an increase in tyrosine phosphorylation of several intracellular proteins, hydrolysis of membrane phospholipids, fluxes in the concentration of intracellular free Ca2+, activation of several serine/threonine kinases including components of the MAP kinase pathway, and changes in the activities of a panel of transcription factors. Although much is known about the biochemical changes occurring in response to BCR-mediated activation, the differences in the signal transduction pathways that give rise to the different cellular responses following activation of the same receptor in immature versus mature cells have yet to be elucidated completely (discussed in detail in refs. ). Some of the earliest changes that occur following BCR engagement are the activation of several non-receptor protein tyrosine kinases (PTKs), including p55 blk (Blk), p59 fyn (Fyn) and p53/56 lyn (Lyn) of the Src family , Btk of the Itk/Tec family [32, 33] and p72 Syk (Syk) of the Syk/ZAP-70 family . The importance of Syk in BCR signaling and lymphocyte development has been clearly demonstrated using gene inactivation approaches. Although syk-deficient mice die perinatally, analysis of radiation chimeras reconstituted with fetal liver from syk-deficient mice has demonstrated a block in the transition from proB cells to preB cells, indicating that signal transduction through Syk is required for early B cell development [35, 36]. Inactivation of the syk gene in the chicken DT40 B cell lymphoma leads to a loss in the activation of PLCγ2, the increase in intracellular free Ca2+ and the apoptotic response following engagement of the BCR. In contrast, BCR-mediated activation of Lyn kinase was largely maintained [37, 38]. The Syk-dependent signaling pathway appears to be facilitated by the adaptor molecule BLNK (also known as SLP-65 and BASH) [39–41]. Syk can induce the phosphorylation of BLNK in co-transfection experiments , which may be important for the recruitment of other Syk substrates like PLCγ2 through a scaffolding function . BLNK function is necessary for signal transduction since no Ca2+ flux or PLCγ2 phosphorylation is observed in response to BCR engagement in BLNK-deficient DT40 cells . The formation of large protein complexes associated with the membrane receptor through specific protein-protein interactions appears to be an early step in BCR-mediated signal transduction. In response to receptor activation, Syk becomes non-covalently associated with the BCR through tandem SH2 domains located in the amino terminal half of the protein . Following engagement of the BCR, phosphorylation of specific tyrosine residues in immunoreceptor tyrosine-based activation motifs (ITAMs) found within the cytoplasmic tails of CD79a and CD79b provides docking sites for Syk localization [45–47]. The ability of phosphorylated ITAM peptides to selectively enhance Syk kinase activity in vitro suggests that recruitment of Syk to the receptor complex may serve to activate the kinase, in part, through allosteric changes in the structure of the Syk protein [44, 48, 49]. Upon activation, Syk and the receptor complex become localized in detergent-resistant cholesterol-rich membrane microdomains (lipid rafts), resulting in the segregation of the BCR complex from other membrane components . In this report, we describe the use of a mutant form of Syk that leads to the constitutive activation of the endogenous wildtype Syk kinase when introduced into B cells – a dominant positive effect – in the absence of detectable tyrosine phosphorylation. It was anticipated that the presence of a constitutively active Syk enzyme could help in delineating the signaling events that occur upstream and downstream of Syk activation in the BCR signal transduction pathway. However, although these cells carry a highly active Syk kinase, no evidence for downstream signaling was found. These data indicate that activation of Syk kinase enzymatic activity in cells is insufficient for signal transduction. Stimulation through the BCR has been shown to induce changes in cell growth and viability in several B cell systems, including the human Daudi, chicken DT40 and mouse WEHI-231 and BCL1.3B3 B cell lymphomas [12, 19, 27, 38, 51–53]. For example, stimulation of BCL1.3B3 through the BCR suppressed exponential population growth in cell culture (Figure 1A). Using flow cytometry to measure membrane permeability and DNA content of cells, BCR stimulation resulted in a 5-fold increase (6.5 to 32.6%) in the proportion of apoptotic cells after 24 hrs (Figure 1B). BCR engagement induces growth arrest associated with apoptosis in BCL 1 .3B3 (A) BCL1.3B3 cells were plated at 1 × 105 cells/ml for 24 hours and then incubated with 15 μg/ml of rabbit anti-IgM (anti-IgM – closed circle) or control rabbit anti-ovalbumin (anti-ova – open circle) antibody on day 0. Samples were harvested, stained with Trypan blue and counted on the indicated days. (B) BCL1.3B3 cells were plated at 2 × 105 cells/ml and incubated with 25 μg of rabbit anti-IgM antibody or control rabbit anti-ova antibody for 24 hours. Samples were then harvested, stained with 7-AAD and Hoechst 33342, and analyzed by flow cytometry. In the dot plot analysis of 7-AAD (x-axis) and Hoechst (y-axis) fluorescence, the apoptotic population is circled. BCR-mediated tyrosine kinase activation is thought to be involved in the signal transduction cascades that give rise to these changes in cell growth and viability . To determine if BCR engagement under these conditions leads to Syk kinase activation, increasing amounts of anti-IgM were added to cultured BCL1.3B3 cells. An in vitro Syk specific immune-complex kinase assay was used to measure changes in Syk activity in response to BCR stimulation (Figure 2A). In unstimulated and control treated BCL1.3B3 cells (lanes 1 and 6), low, basal levels of Syk activity were detected. The autophosphorylation activity of Syk increased dramatically with the addition of anti-IgM; Syk activity responded in a dose dependent manner and reached a plateau at 10 μg (lane 4) in which activity was ~15 fold higher than in unstimulated cells. Syk kinase activation and phosphorylation in response to BCR engagement (A) The immune complex kinase assay (ICKA) was used to determine Syk activity in BCL1.3B3 cells after incubation with rabbit anti-IgM antibody (0 – 20 μg; lanes 1 – 5) or control rabbit anti-ova antibody (20 μg; lane 6) for 0.5 minutes. Samples were lysed in an NP-40 lysis buffer, Syk was immunoprecipitated with rabbit anti-Syk-coated protein A agarose beads, and incubated with γ-32P ATP. The immunoprecipitates were resolved by SDS-PAGE and visualized using a phosphorimager. As immunoprecipitation controls, BCL1.3B3 cells were lysed and samples immunoprecipitated with rabbit α-ova-coated beads (lane 7) or with uncoated beads (lane 8). The arrowhead marks the migration position of Syk. (B) The kinetics of Syk activation was determined by the (ICKA). Syk was immunoprecipitated from BCL1.3B3 cells incubated with 15 μg of anti-IgM for 0–10 minutes (lanes 1–5) and analyzed as described above. As an immunoprecipitation control, cells were stimulated, lysed, and incubated with anti-ova-coated beads (lane 6). The arrowhead marks the migration position of Syk. (C) Phosphotyrosine levels were determined by anti-phosphotyrosine (anti-PY) immunoblotting. BCL1.3B3 cells were unstimulated (lane 1) or stimulated with 15 μg of anti-IgM (lanes 2 and 3) or anti-ova (lanes 4 and 5) for 0, 0.5, or 5 minutes as indicated. After the cells were lysed, Syk was immunoprecipitated, resolved by SDS-PAGE under non-reducing conditions, transferred to nitrocellulose, and probed with anti-PY antibody (top panel). The blot was stripped and reprobed with an anti-Syk antibody (bottom panel). The arrowhead marks the migration position of Syk. The kinetics of BCR-induced Syk activation was analyzed to determine the rates of Syk kinase activation and inactivation following initial engagement of the BCR (Figure 2B). Maximal Syk activation occurred within 1 min of receptor engagement (lane 3) and decreased to intermediate levels at times thereafter (lanes 4 and 5). Additional experiments revealed that even 1 hour after BCR stimulation, Syk activity remained slightly elevated in comparison with unstimulated cells (data not shown). The increase in Syk activity in response to BCR engagement in BCL1.3B3 was accompanied by an increase in tyrosine phosphorylation of Syk protein in cells (Figure 2C). No phosphorylated tyrosine residues were detected on Syk in unstimulated or control treated cells (lanes 1,4, and 5). Tyrosine phosphorylation of Syk peaked after 30 seconds of BCR stimulation (lane 2) and decreased by 5 minutes (lane 3). The rapid induction of tyrosine phosphorylation and its subsequent reduction paralleled the kinetics of Syk kinase activity (Figure 2B). BCR-mediated apoptosis was preceded by an increase in Syk kinase activity in BCL1.3B3. Syk has also been implicated in BCR-induced apoptosis found in the chicken B lymphoma line, DT40 . To determine the role of Syk kinase activation in the apoptotic response in BCL1.3B3, overexpression of a mutant form of Syk was used in an effort to alter the level of Syk activation following BCR engagement. Site-specific mutations were placed in two regions of Syk. A lysine at amino acid position 395, predicted to be critical for kinase activity, was replaced by an alanine (Figure 3A). Three carboxy-terminal tyrosines (positions 624–6), hypothesized to play regulatory roles, were replaced by phenylalanines. Based on the effects of similar mutations in other kinases it was expected that the combination of these replacements in (K395A/3F)Syk might produce a dominant negative effect. Expression of the (K395A/3F)Syk molecule is associated with constitutive Syk kinase activity (A) The amino acid changes introduced into wildtype Syk to create the (K395A/3F) Syk mutant include the substitution of lysine at amino acid 395 with alanine and the substitution of three tyrosines at amino acid positions 624–6 in the carboxy-terminus with phenylalanines. (B) The strategy for simultaneously detecting both the (K395A/3F)Syk and endogenous Syk mRNA by RT-PCR involves the use of three primers. In this case, Primer 3 is complementary to sequences in both the transgene and endogenous syk gene cDNAs, while Primers 1 and 2 are specific for sequences in the transgene and endogenous syk gene cDNA, respectively. The PCR products produced with Primers 1 and 3 from the transgene cDNA template are larger than the PCR products produced with Primers 2 and 3 from the endogenous gene cDNA template. The size difference can be assessed following separation by agarose gel electrophoresis. (C) mRNA expression levels of the (K395A/3F)Syk transgene (T) and endogenous (E) Syk gene in BCL1.3B3 (lane 2), a clone infected with the empty retroviral vector (lane 3), and (K395A/3F)Syk mutant clones (lanes 4–10) were determined using the RT-PCR strategy described above. All samples were prepared with (+R.T., upper panel) or without (-R.T., lower panel) reverse transcriptase to control for amplification of contaminating genomic DNA. (D) Syk activity was evaluated following immunoprecipitation with anti-Syk antibodies from unstimulated (-) or stimulated (+; 15 μg of anti-IgM for 30 seconds) BCL1.3B3 or (K395A/3F)Syk-containing clones (2.1.6, 2.4.2, 2.1.2, and 2.1.7) by the ICKA. Anti-ova was used as an immunoprecipitation control (C; lanes 3, 6, 9, 12, and 15). (E) BCL1.3B3, cells infected with the MSCV2.1 expression vector alone (vector control) and (K395A/3F)Syk-infected clones 2.1.2 and 2.1.6, were incubated with or without 15 μg of anti-IgM or anti-ova for the indicated times and Syk activity evaluated by the ICKA (lanes 1–6). Anti-ova-coated beads were used as an immunoprecipitation control (C; lane 7). (F) Syk was immunoprecipitated from unstimulated (no antibody (-) or anti-ova (C)) or stimulated (+; 15 μg anti-IgM for 0.5 minutes) BCL1.3B3, a vector control clone, and (K395A/3F)Syk clones 2.1.2 and 2.4.2. The immunoprecipitates were resolved by SDS-PAGE and evaluated by anti-PY immunoblotting (upper panel). 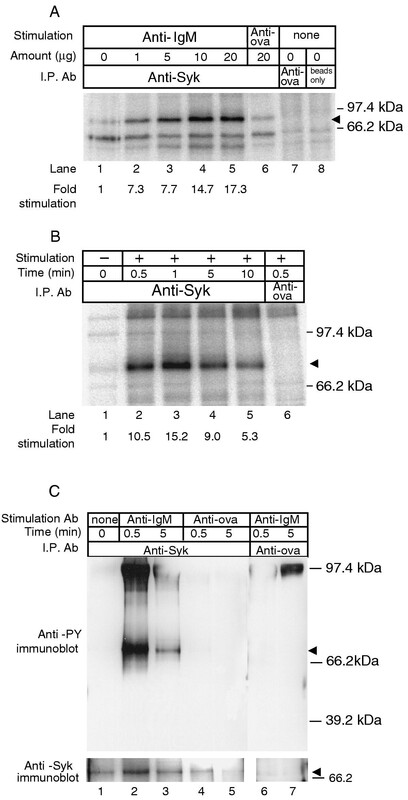 The blot was stripped and reprobed with an anti-Syk antibody (lower panel). Our data suggests that the binding activity of the antibody used for immunoprecipitation is partly influenced by the phosphorylation status of Syk; although phosphorylation is not required for antibody binding, the amount of Syk present in the immunoblot reflects the level of phosphorylation of the protein to some degree. BCL1.3B3 cells were infected with defective retroviruses expressing wildtype or (K395A/3F) mutant Syk. Clones expressing varying levels of wildtype or mutant Syk mRNA were identified using a three-primer reverse transcriptase polymerase chain reaction (RT-PCR) assay (Figure 3B). Using this approach, PCR products differing in size were simultaneously amplified from the transgene and the endogenous syk cDNAs in the same PCR reaction. (K395A/3F)Syk expression varied relative to endogenous Syk and ranged from undetectable levels (Figure 3C; lanes 8–10) to equivalent expression levels (lane 4). The highest transgene expression was found in clone 2.1.2. The ICKA was used to determine the effect of (K395A/3F)Syk expression on endogenous Syk. Syk activity was measured in parental BCL1.3B3 (Figure 3D, lanes 1–3) and cells that express the (K395A/3F)Syk molecule (lanes 4 – 15). Surprisingly, cells that expressed the (K395A/3F)Syk molecule displayed constitutive Syk activity in unstimulated cells (lanes 4,7, and 10). A correlation between constitutive kinase activity and mRNA expression levels of (K395A/3F)Syk was observed (compare Figure 3C with Figure 3D); clones with higher levels of (K395A/3F)Syk mRNA (e.g. clone 2.1.2) had higher levels of constitutive kinase activity, while clones with lower levels of (K395A/3F) Syk mRNA (e.g. clones 2.1.6, 2.4.2 and 2.1.7) had lower levels of constitutive kinase activity. Thus, it appeared that introduction of this mutant form of Syk resulted in a dominant positive effect on kinase activity rather than a dominant negative effect. To determine if the observed Syk activity is an artefact of the in vitro assay, a series of immune complex kinase assays of Syk precipitated from mixtures of lysates was performed. Most significantly, a mixture of a lysate from unstimulated BCL1.3B3 cells harbouring wildtype Syk with a lysate from unstimulated DT40 expressing the K395A, 3F mutant Syk (see below), at 1:5, 1:1 and 5:1 ratios, showed no activity in the immune complex kinase assay (data not shown). These data indicate that the mutant Syk protein must be expressed together with the wildtype enzyme in cells to generate the dominant positive phenotype, and suggest that it's effect is indirect. Although we cannot rule out the possibility that the kinase activation is occurring during the isolation procedure, the results of the mixing experiment suggest that the wildtype Syk enzyme is active in vivo under these conditions. To determine if expression of the (K395A/3F)Syk mutant resulted in a change in BCR responsiveness, the kinetics of Syk activation were measured in clones 2.1.2 and 2.1.6 following BCR stimulation (Figure 3E). Incubation with anti-IgM induced a rapid increase and delayed reduction in Syk activity with kinetics similar to that of control clones. Although the basal levels of Syk activity were elevated in clones that expressed the (K395A/3F)Syk molecule, the cells were still responsive to BCR signaling. To determine if the constitutive Syk activity observed in unstimulated cells carrying the (K395A/3F) transgene was accompanied by constitutive Syk tyrosine phosphorylation, the levels of phosphotyrosine on Syk were determined by immunoblotting after immunoprecipitation (Figure 3F). Syk from unstimulated BCL1.3B3 and vector control clones had undetectable levels of phospho-tyrosine (lanes 1,3,4, and 6, upper panel). Syk from unstimulated clones carrying the (K395A/3F) transgene, which had constitutive Syk activity, also had undetectable levels of tyrosine phosphorylation (lane 7, 9, 10 and 12, upper panel). Thus, despite constitutive Syk activity observed in these infectants, tyrosine phosphorylation did not correlate with activity (compare lanes 7 and 10 of Figure 3D with lanes 10 and 7 of Figure 3F). Syk from all clones analyzed became tyrosine phosphorylated after BCR stimulation (lanes 2, 5, 8 and 11). It was possible that more Syk in the immunoprecipitate was required for detection by the anti-phosphotyrosine antibody. However, even when more protein was present in the immunoprecipitate, little if any phosphotyrosine was detected in unstimulated cells (lanes 13 and 15). These results indicate that Syk activation does not require tyrosine phosphorylation. Two hypotheses were considered to explain the high level of Syk autophosphorylation in the ICKA. In unstimulated clones expressing the (K395A/3F)Syk molecule, the possibility existed that the intense band observed in the ICKA (Figure 3D lanes 4, 7, and 10) was not due to increased Syk activity, but rather to the ability of the background levels of active endogenous Syk to preferentially phosphorylate the (K395A/3F)Syk molecule due to possible changes in its three-dimensional structure. If the kinase activity of Syk was truly higher in cells expressing (K395A/3F)Syk, enhanced phosphorylation of an exogenous substrate would also be observed. To examine the ability of Syk from cells that expressed (K395A/3F)Syk to phosphorylate an exogenous Syk target, c3b-GST was added to the Syk ICKA (Figure 4, lower panels). The exogenous substrate was phosphorylated by Syk from unstimulated clones expressing the (K395A/3F)Syk molecule (lane 7 lower panel), demonstrating that the Syk enzyme isolated from these cells was highly active. Syk isolated from unstimulated (K395A/3F)Syk-infected clones can phosphorylate an exogenous substrate Syk was immunoprecipitated from an unstimulated (-) or stimulated (+, 15 μg anti-IgM for 0.5 minutes) vector control clone and from a clone expressing the (K395A/3F)Syk molecule (clone 2.1.2). The ICKA was performed with (lanes 3, 4, 7, and 8) and without (lanes 1, 2, 5, and 6) the human erythrocyte band-GST substrate, c3B. The arrowhead and arrow mark the migration position of phosphorylated Syk and phosphorylated c3B, respectively. Although activated endogenous Syk was the likely source of the constitutive Syk activity observed in clones that expressed the (K395A/3F)Syk molecule, the possibility remained that the activity might originate from the (K395A/3F)Syk molecule itself. As proof that the (K395A/3F)Syk molecule was inactive as predicted, (K395A/3F)Syk and wildtype Syk expression constructs were transfected into syk-negative DT40 cells, and activity measured by the ICKA (Figure 5). While wildtype human Syk was capable of autophosphorylation (lane 2 upper panel), the (K395A/3F)Syk mutant was not (lanes 3 and 4) demonstrating that this molecule was kinase-dead. This result indicates that the constitutive Syk activity identified in BCL1.3B3 clones expressing (K395A/3F)Syk was likely due to endogenous Syk and not the (K395A/3F)Syk mutant. The (K395A/3F)Syk protein is enzymatically inactive Wildtype human Syk and (K395A/3F)Syk were transfected into syk-negative DT40 chicken B lymphoma cells and cloned. Syk kinase activity was evaluated by ICKA (upper panel) in extracts prepared from clones. 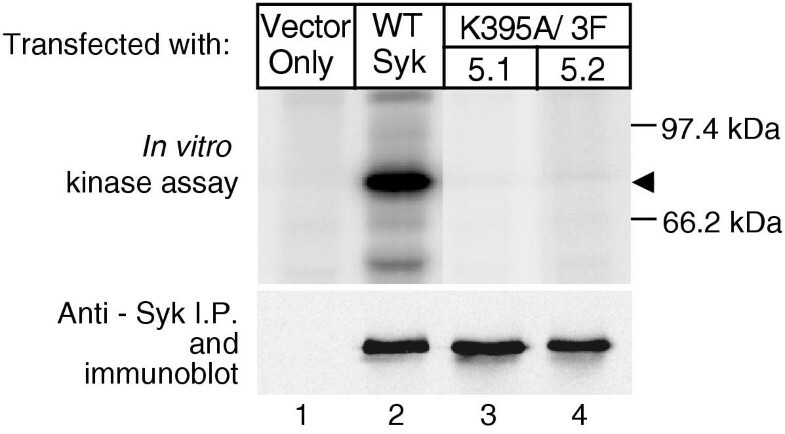 The levels of wildtype human Syk and the (K395A/3F)Syk protein in the immunoprecipitate were also evaluated by anti-Syk immunoblotting (lower panel). Clones 5.1 and 5.2 represent two independent lines that express the (K395A/3F)Syk protein. The arrowhead marks the migration position of Syk. It should be noted that although these data indicate that mutant Syk is expressed in DT40 cells and that it is enzymatically inactive, expression of mutant Syk protein in BCL1.3B3 has not been demonstrated in these experiments. Expression of the (K395A/3F)Syk molecule resulted in constitutive activation of Syk. However, overexpression of a full-length unmutated Syk might also generate the same phenotype. To determine if the constitutive phenotype was a result of the specific mutations introduced or if overexpression of a full-length Syk molecule was sufficient to give high basal kinase activity, Syk activity was analyzed from BCL1.3B3 cells that expressed a wildtype human Syk transgene (Figure 6). The levels of wild-type human Syk expression were determined using the three-primer RT-PCR assay described earlier (Figure 6A). Shown are representative clones that expressed low levels or equivalent levels of human Syk mRNA as compared with the levels of endogenous Syk mRNA (lanes 3 and 4, upper panel). The levels of Syk activity in unstimulated cells expressing wildtype Syk were indistinguishable from the levels in unstimulated controls (Figure 6B, compare lanes 1,4, and 7). None of the clones analyzed contained elevated constitutive Syk activity in unstimulated cells, demonstrating that this phenotype requires the presence of the unique mutations introduced. Overexpression of a wildtype Syk transgene does not result in constitutive Syk kinase activity (A) Expression levels of a wildtype Syk transgene (T) were evaluated as described in Figure 3C, using RNA isolated from BCL1.3B3 (lane 1), a control vector-infected cell line (lane 2), and wildtype Syk-infected clones (lanes 3 and 4). (B). An ICKA for Syk immunoprecipitated from unstimulated (-) and stimulated (+; 15 μg anti-IgM for 0.5 minutes) BCL1.3B3 and wildtype Syk-infected clones (2.4.1 and 2.4.3). The arrow marks the migration position of Syk. Anti-ova was used as an immunoprecipitation control (C; lanes 3, 6, and 9). In syk-deficient DT40 cells, BCR induced apoptosis was abrogated indicating that Syk was necessary for this cellular response . Having established cells with constitutive Syk activity, it was now possible to establish if Syk activation is sufficient for any of the signaling responses. 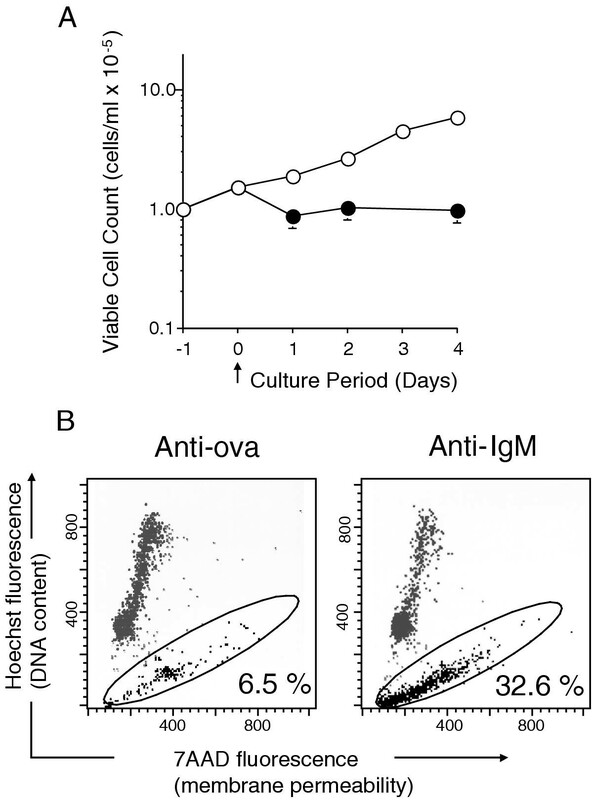 However, no impact on cell growth in culture was found in clones with high constitutive Syk activity, nor was the growth suppressive effect of anti-IgM treatment enhanced (Figure 7A). Likewise, no significant difference in apoptosis was observed between clones with constitutive Syk activity and controls (Figure 7B). 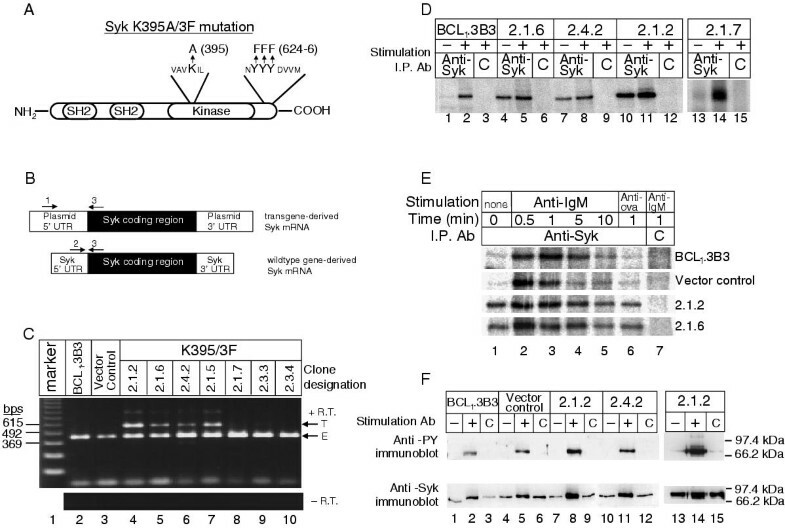 Signal transduction and induced apoptosis are unchanged in (K395A/3F)Syk-infected cells despite constitutive Syk kinase activity (A) A vector-infected control (circle) and a (K395A/3F)Syk-infected clone with constitutive Syk activity, 2.1.2 (square), were plated at 1 × 105 cells/ml and 10 μg anti-IgM (closed symbols) or anti-ova (open symbols) added 24 hrs later on day 0. Samples were harvested on the indicated days, stained with Trypan blue and viable cell counts were determined. (B) The responses of a vector control clone (upper row) and (K395A/3F)Syk-infected clone 2.1.2 (lower row) to BCR signaling were analyzed. 2 × 105 cells were incubated with 15 μg of a polyclonal, goat anti-IgM antibody or 15 μg of a species-matched control antibody (control Ig) for 24 hours. Samples were harvested, stained with 7-AAD and Hoechst 33342, and analyzed by flow cytometry. In the dot plot analysis of the 7-AAD (x-axis) and Hoechst (y-axis) fluorescence, the apoptotic population is circled. The results presented are representative of three independent experiments with similar results. (C) Constitutive Syk activity does not give rise to a detectable increase in intracellular protein tyrosine phosphorylation. 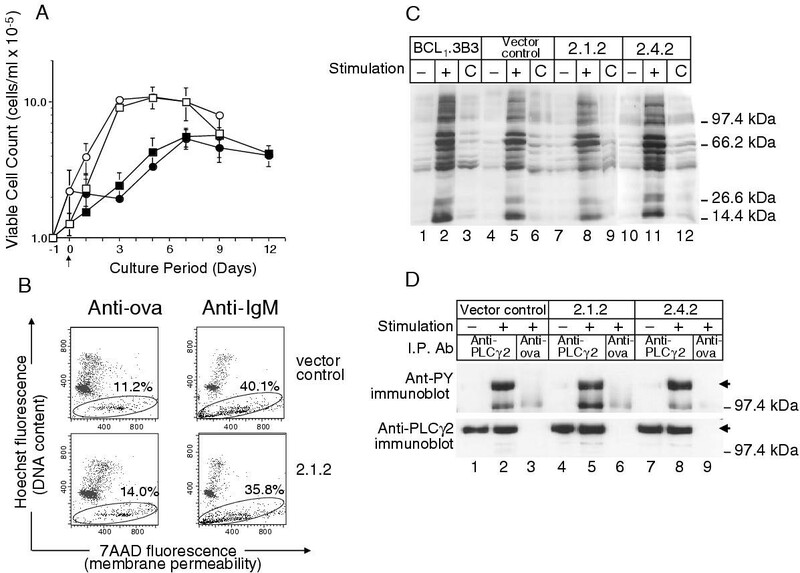 Cell lysates were prepared from unstimulated (no antibody (-) or anti-ova (C)) and stimulated (+; 15 μg anti-IgM for 0.5 minutes) BCL1.3B3, a vector-infected control, and (K395A/3F)Syk-infected clones 2.1.2 and 2.4.2 and analyzed by anti-PY immunoblotting. (D) PLCγ2 is not tyrosine phosphorylated in (K395A/3F)Syk-infected clones with constitutive Syk activity. PLCγ2 was immunoprecipitated from an unstimulated (-) and stimulated (+, 15 μg anti-IgM for 0.5 minutes) vector-infected control clone and (K395A/3F)Syk-infected clones 2.1.2, and 2.4.2. The immunoprecipitates were resolved by SDS-PAGE and analyzed by anti-PY immunoblotting (top panel). The blot was stripped and reprobed with an anti-PLCγ2 antibody (bottom panel). Anti-ova was used as an immunoprecipitation control (lanes 3, 6, and 9). The arrows mark the migration position of PLCγ2. Thus, Syk kinase activity alone was insufficient to signal a cellular response in BCL1.3B3. However, the presence of Syk kinase activity was still expected to lead to increased phosphorylation of protein targets in the absence of stimulation through the BCR. To examine this possibility, the levels of protein phosphotyrosine were evaluated by immunoblotting (Figure 7C). Basal levels of phosphotyrosine-containing protein were detected in all clones analyzed (lanes 1,4,7, and 10). However, no increase was observed in cells with constitutive Syk activity. After stimulation of BCR, many intracellular proteins became highly phosphorylated on tyrosine to equivalent levels in all clones, regardless of the level of Syk kinase activity (lanes 2, 5, 8 and 11). These data indicate that despite elevated basal and induced Syk kinase activity in clones carrying the (K395A/3F)Syk mutant, global phosphorylation of cellular proteins was not increased. 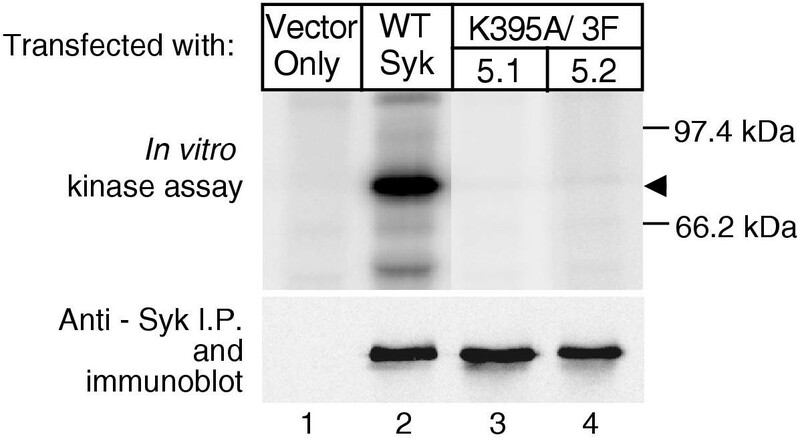 The anti-phosphotyrosine immunoblot used is a relatively crude measure of Syk kinase activity in vivo. The possibility remained that any specific effects of constitutive Syk on its downstream targets might be masked by the combined effects of the other tyrosine kinases activated in response to BCR signaling. To focus the investigation on downstream events of Syk activation, the phosphorylation state of PLCγ2, an authentic, direct downstream target of Syk , was evaluated. No PLCγ2 phosphorylation was detected in unstimulated clones containing constitutive Syk activity (Figure 7D, lanes 4 and 7, upper panel). In contrast, PLCγ2 was rapidly and highly phosphorylated after stimulation of BCR (lanes 5 and 8). As in the total cellular phosphotyrosine analysis, the levels of phosphotyrosine on PLCγ2 were indistinguishable between control and experimental cell lines. Previous studies have identified apoptosis and cell cycle arrest as mechanisms of BCR-induced growth arrest in BCL1.3B3 cells . The studies presented here have demonstrated that stimulation of the BCR resulted in the rapid and transient activation of the non-receptor tyrosine kinase, Syk. 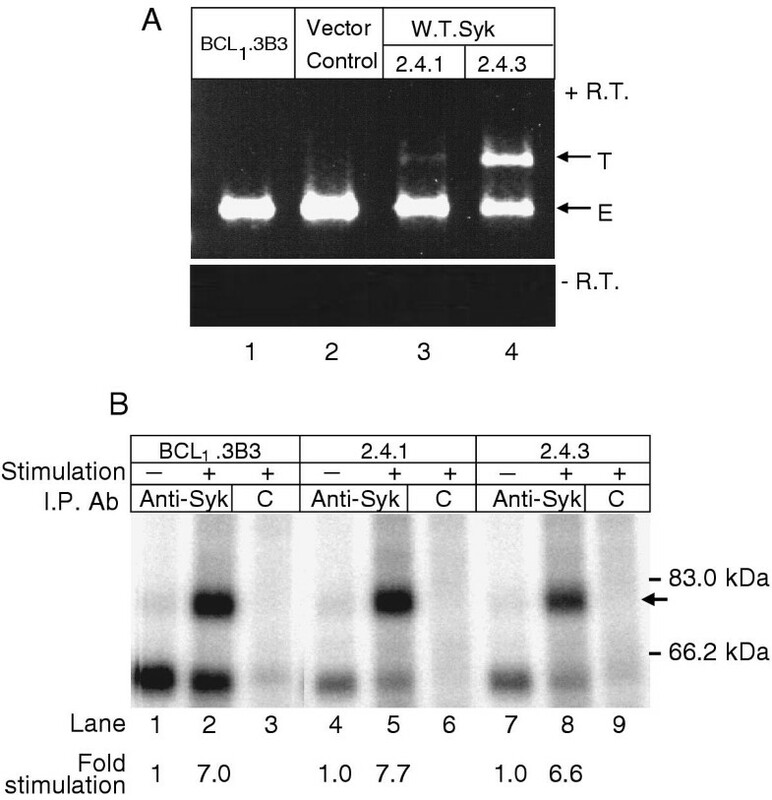 Previous studies have implicated Syk in BCR-induced apoptosis in other cell lines [37, 38]. To examine the putative role of Syk in BCR-induced apoptosis and cell cycle arrest in BCL1.3B3, we attempted to alter Syk activity through the expression of mutant forms of Syk. When the (K395A/3F)Syk mutant was co-expressed with endogenous Syk in BCL1.3B3 cells, a constitutive Syk activation phenotype was observed. The presence of elevated Syk activity allowed us to evaluate the role of Syk activation on the growth and viability of BCL1.3B3, and on other biochemical changes associated with BCR signaling. To our surprise, no evidence for downstream signaling was found in cells with high levels of Syk kinase activity. Two novel observations were obtained from these studies. First, expression of the (K395A/3F)Syk molecule in BCL1.3B3 results in constitutive activation of endogenous Syk. Since (K395A/3F)Syk was enzymatically inactive when transfected into Syk-deficient DT40 cells, the observed constitutive kinase activity must be derived from endogenous Syk and not from the (K395A/3F)Syk protein. Mutant molecules that inhibit the activation or function of the wildtype counterpart in the same cell have been defined as dominant-negative molecules. Since (K395A/3F)Syk has an activating effect on endogenous wildtype Syk, we propose that (K395A/3F)Syk is a dominant-positive molecule. It is likely that the replacement of the three carboxy-terminal tyrosine residues with phenylalanine is necessary for the dominant-positive phenotype. Zeitlmann et al. found that transfection of a mutant Syk expression construct carrying only the 3F alteration into a T cell lines could overcome the need for TCR occupancy for IL-2 expression in PMA-treated cells . However, since the mutant Syk used retained kinase activity, these studies could not distinguish between a gain-of-function effect versus a dominant-positive effect as found here. The mechanism by which the (K395A/3F)Syk molecule activates endogenous Syk is unknown. One hypothesis is that a negative regulator of Syk is bound and sequestered by the (K395A/3F)Syk molecule. By sequestering this negative regulator, expression of the mutant Syk molecules gives rise to the activation of the endogenous wildtype protein in the absence of specific stimulation, leading to a constitutively active Syk phenotype. Several negative regulators of Syk have been reported. BCR-induced interaction between Cbl and Syk increases the susceptibility of Syk to proteolysis , possibly through enhancement of ubiquitination . Expression of a dominant-negative SHP-1 phosphatase in the mature murine B cell line K46 resulted in an increase in BCR-induced Syk kinase activity as measured by C3b phosphorylation in an ICKA and enhanced BCR-induced Ca2+ fluxes . It remains to be determined if interference with any of these known regulatory proteins is responsible for the dominant-positive effect. The second novel observation, that Syk kinase enzymatic activity was insufficient for signal transduction, suggests that multiple biochemical processes may be required for the Syk-dependent step of signal transduction. Presently, it is unclear what biochemical changes, other than enzymatic activation, are required. However, in light of the present model of signaling through the BCR, perhaps appropriate subcellular localization to the BCR protein complex and the ITAMs of CD79b (Igβ) is also required. In support of this hypothesis, Syk did not co-precipitate with IgM in (K395A/3F)Syk-containing cells, without stimulation (data not shown). This is not surprising since the ITAMs in CD79, which are proposed to be docking sites for Syk, are unlikely to be phosphorylated in the absence of BCR stimulation since phosphorylation of these residues likely requires activation of Src family tyrosine kinases expressed in B cells. Therefore, despite constitutive Syk kinase activity, the ITAMs in the dominant-positive-expressing cells remain hypophosphorylated because kinases that are upstream of Syk and/or are Syk independent are not active in the absence of BCR crosslinking. This result implies that in addition to enzymatic activation, localization of Syk to the BCR might be required for functional signal transduction. There is precedence for this model. Mutation of tyrosine 130 in Syk to glutamic acid had two effects. First, the Y130E mutation resulted in constitutive activity of Syk. Second, molecules with the Y130E mutations did not co-immunoprecipitate with the BCR . A second example involves an in vitro model of histamine release in the Syk-deficient RBL-2H3 cell line . When tyrosines 519 and 520 were mutated and introduced into Syk-deficient RBL-2H3 cells, these Syk molecules were capable of phosphorylation of c3b substrate in an ICKA. However, despite this activity, there was no high affinity IgE receptor (FcεRI)-induced degranulation. Further analysis demonstrated neither increases in phosphotyrosine nor phosphorylation of PLCγ2. Alternatively, the absence of signal transduction in the presence of Syk activity may be related to its ability to interact with its downstream targets. Within Syk there are two phosphotyrosine-binding SH2 domains, allowing for protein-protein interactions. In addition, phosphotyrosine residues in Syk would provide additional sites for protein-protein interactions. Perhaps, further modification is necessary to increase its affinity for downstream binding partners, e.g. BLNK or PLCγ2. The absence of signaling in the presence of constitutive enzymatic activity described for Syk in different systems implies that execution of the Syk-dependent step in this signaling cascade is a multi-step process. Multiple requirements for progression through this step in the signal transduction pathway may serve to integrate the cellular response to multiple environmental cues. In this case, the ultimate cellular response to the activation of the BCR signaling pathway is cell death. Each of these required steps may provide a regulatory site where other signal transduction pathways could intersect the default response to antigenic stimulation giving rise to an altered cellular outcome. In summary, here we describe the use of a mutant Syk construct to produce a dominant-positive effect on endogenous Syk activation in the absence of BCR engagement. The presence of a dominant-positive effect under these conditions suggests that the Syk kinase is kept inactive in resting cells by an active suppression mechanisms, which is disrupted by the presence of the (K395A/3F)Syk mutant. The specific target for this dominant-positive effect remains to be identified. Although the Syk enzyme is active under these conditions, it lacks any detectable phosphorylation on tyrosine residues. This observation indicates that the current paradigm that Syk activation results from tyrosine phosphorylation may be incorrect. Finally, the presence of a highly active Syk enzyme in cells was insufficient for downstream signal transduction as evidenced by a lack of change in global tyrosine phosphorylation, phosphorylation of PLC-γ2 or enhanced spontaneous or induced apoptosis. These data suggest that the Syk-dependent step in signal transduction requires biochemical changes in addition to enzymatic activation, perhaps proper localization of the active enzyme to a signaling receptor complex. The in vitro-adapted BCL1.3B3 cell line was previously selected from the BCL1 mouse B cell lymphoma for growth in cell culture . BCL1.3B3 cells were grown in RPMI supplemented with 25 μg/ml gentamycin, 2 mM L-glutamine, 100 U/ml penicillin, 100 U/ml streptomycin, non-essential amino acids (0.1 mM each), 1 mM sodium pyruvate, 55 μM β-mercaptoethanol, and 5 % heat-inactivated fetal calf serum. For BCL1.3B3 infected clones the medium was supplemented with 1 mg/ml G418. The syk-negative DT40 chicken B cell line was obtained from T. Kurosaki and was grown in RPMI supplemented with 2 mM L-glutamine, 55 μM β-mercaptoethanol, 10 % heat-inactivated fetal calf serum, and 2 % heat-inactivated chicken serum. For the syk-negative DT40 transfectants the medium was supplemented with 2 mg/ml hygromycin B (Calbiochem, San Diego, CA). All culture medium products were from Gibco BRL (Gaithersburg, MD), unless otherwise specified. Polyclonal rabbit anti-IgM antibodies were used to signal BCL1.3B3 through the BCR . Polyclonal rabbit anti-ovalbumin was used as a negative control for activation and immunoprecipitation experiments. Both polyclonal antibody preparations were purified by affinity chromatography on Sepharose-antigen columns . Immunoprecipitation of Syk protein utilized an affinity purified rabbit anti-Syk antibody (SC-573, Santa Cruz Biotechnology, Santa Cruz, CA, unless otherwise specified). Immunoblotting for the detection of Syk protein utilized a rabbit anti-Syk antibody generated against a different epitope (SC-1077, Santa Cruz Biotechnology). An affinity purified anti-PLCγ2 antibody (SC406, Santa Cruz Biotechnology), was used for both immunoprecipitation and immunoblotting. An anti-phosphotyrosine antibody conjugated to horseradish peroxidase (SC7020, Santa Cruz Biotechnology) was used for the detection of phosphotyrosine-containing proteins by immunoblotting. Cells were plated in 1 ml of growth medium in flat-bottom 24-well plates at a concentration of 2 – 3 × 105 cells/ml for 24 hr before stimulation with antibodies. All samples were plated in duplicate unless specified. Cells were harvested and washed twice with PBS containing 1% fetal bovine serum. For cell count experiments, viable cells were enumerated by Trypan Blue exclusion using a hemocytometer (Sigma-Aldrich Inc, St. Louis, MO). For apoptosis determinations, cells were resuspended in 50 μl of 400 μM 7-amino actinomycin D (7-AAD) (Molecular Probes, Inc., Eugene, OR) and incubated for 30 minutes in the dark on ice. Cells were then simultaneously fixed with the addition of 830 μl of 0.5% paraformaldehyde in PBS and stained with the addition of 220 μl of 10 μg/ml Hoechst 33342 (Molecular Probes, Inc.) containing 5% Tween-20 (Sigma-Aldrich, Inc) for at least 16 hours at 4°C in the dark. Fluorescence data from 1 × 104 cells was collected using a FACStar™ Plus (Becton Dickinson, San Diego, CA) and analyzed with CELLQUEST software (Becton Dickinson). The retroviral vectors and ecotropic packaging cell line, BOSC23, used were obtained from W. Pear (U. Penn) and have been described elsewhere . MSCV2.1 and MSCVhph contain the neomycin and hygromycin resistance genes, respectively. DNA carrying the wildtype syk coding region was generated by polymerase chain reaction (PCR) using high fidelity polymerase (Perkin Elmer, Branchburg, NJ) forward-5'gacacctgccgaggtgtgtg3' and reverse 5'gagggaggtggctgacaatc3' primers, and random-primed cDNA template derived from the human Burkitt's lymphoma cell line, Daudi. The PCR product was cloned into the TA cloning vector pCR3 according to the manufacturer's protocol (Invitrogen, Carlsbad, CA). pCR3/syk was used as a template for introduction of the mutations described in the text using the Transformer Site-Directed Mutagenesis Kit (Clontech, Palo Alto, CA) according to manufacturers instructions. Wildtype and mutant syk DNA fragments were subcloned into the EcoRI site of MSCV2.1. Wildtype and mutant syk DNA fragments were further subcloned from MSCV2.1 into MSCVhph following digestion with BstEII and HpaI. MSCV/syk expression vectors were packaged into viral particles by transient transfection of 1 × 106 BOSC cells with 15 μg of plasmid DNA/CaPO4 precipitates . BCL1.3B3 cells were infected with 500 μl of a 1:2 dilution of viral supernatant in growth medium containing 4 μg/ml polybrene (Sigma-Aldrich, Inc.). Stable infectants were selected in medium supplemented with 1 mg/ml G418 and 15% BCL1.3B3-conditioned medium. Single cell clones were generated by limiting dilution. syk-negative DT40 cells were transfected by electroporation at 950 μFarads, 0.25 kV in PBS using an electroporator (BioRad, Hercules, CA.). Expression vectors conferring hygromycin resistance and containing wildtype or mutant Syk were used. Transfectants were selected in RPMI supplemented with L-glutamine, β-mercaptoethanol and hygromycin B. Bulk culture syk-negative DT40 transfectants were used in the specified experiments. 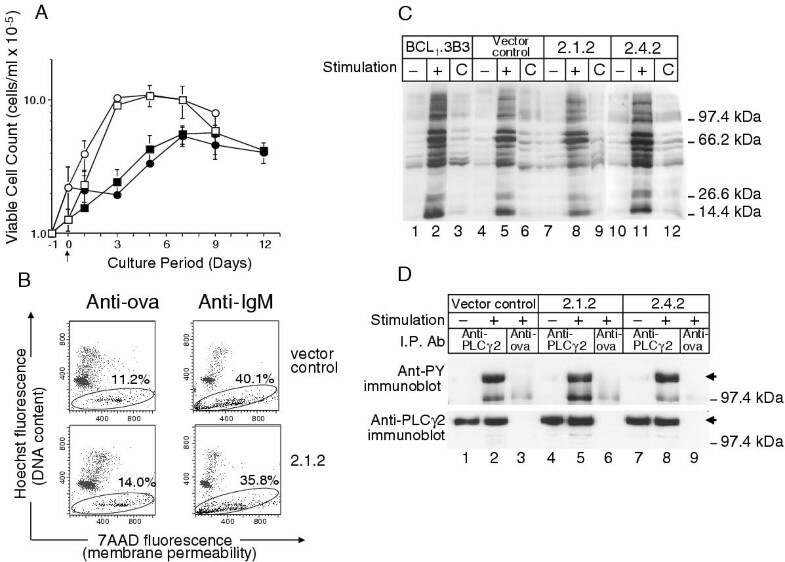 3 – 5 × 106 BCL1.3B3 cells and infectants were stimulated with 15 μg of affinity purified rabbit anti-mouse IgM or anti-ovalbumin antibody at 37°C for 30 sec (unless otherwise specified). Stimulated cells were then resuspended in Lysis Buffer containing 5% nonidet P-40 (NP-40, Sigma-Aldrich, Inc.). After 15 min, Lysis Buffer was added so that the final NP40 concentration was 1%. Lysis Buffer contained 25 mM Tris-HCl pH 7.4, 150 mM NaCl, 1 μg/ml aprotinin, 10 μg/ml leupeptin, 1 mM EDTA, 50 mM NaF, and 1 mM Na orthovanadate (all from Sigma-Aldrich, Inc.). Nuclei were removed by centrifugation at 18,000 × g at 4°C. Supernatants were recovered and incubated with protein-A agarose beads (Gibco BRL) coated with a rabbit anti-Syk antibody (SC-573, Santa Cruz Biotechnology, Inc.) for 30 min. The immunoprecipitates were pelleted, washed three times with wash buffer (1X TBS pH7.5, 0.5 % Triton X 100) and resuspended in Kinase Buffer – 20 mM Tris-HCl pH 7.5, 5 mM MgCl2 and 5 mM MnCl2 (all from Sigma-Aldrich, Inc.). Samples were then incubated with 10 μCi [γ-32P]/1.6 pmol ATP (Amersham-Pharmacia Biotech, Inc., Piscataway, NJ.) for 20 min at room temperature. SDS Sample Buffer was added, and the samples resolved by SDS-PAGE (9% polyacrylamide, BioRad) under reducing conditions unless otherwise specified. The results were visualized and analyzed using a phosphorimager (Molecular Dynamics, Sunnyvale, CA). Low molecular weight protein markers (Boehringer Mannheim/Roche Molecular Biochemicals, Indianapolis, IN) were used as migration standards. In some experiments, rabbit anti-mouse IgM was added to control cells during the lysis step; under these conditions no stimulation of Syk phosphorylation or kinase activity was observed. Immunoprecipitates were generated from 2 × 107 cells as described for the ICKA except that the immunoprecipitates were washed once with PBS and resuspended in SDS Sample Buffer. 10 μl of immunoprecipitated protein were loaded per sample. Samples were resolved by SDS-PAGE (9% polyacrylamide) and electrophoretically transferred to nitrocellulose filters (BioRad). For Syk and PLCγ2 detection, filters were blocked with 5% non-fat dry milk (BioRad). For detection of phosphotyrosine-containing proteins, filters were blocked with 1% bovine serum albumin (Sigma-Aldrich). The authors would like to thank T. Kurosaki for the syk-negative DT40 cell line, W. Pear for the retroviral packaging cells and expression constructs, and especially E. Vitetta and her group for the preparation of affinity purified antibodies. We would also like to thank E. Vitetta, N. vanOers and A. Sinclair for their critical review of the manuscript. This work was supported by grant CA78793 from the National Institutes of Health. RCH carried out the biochemical experiments to characterize the dominant-positive effect and its influence on signal transduction, and drafted the manuscript. AMH and JL helped to define the effects of BCR-mediated signal transduction on the growth and apoptosis of BCL1.3B3. JWH participated in the design of the studies described and in the initial development of the BCL1.3B3 system. RHS conceived of the study, and participated in its design and coordination.